We are pleased to offer the 1899 Society, an exclusive giving society for collegiate members donating $18.99 or more within a calendar year (January 1 to December 31) to the Alpha Sigma Tau Foundation. Your gift to the 1899 Society demonstrates your commitment to empowering your fellow Sisters and growing the future for Alpha Sigma Tau. 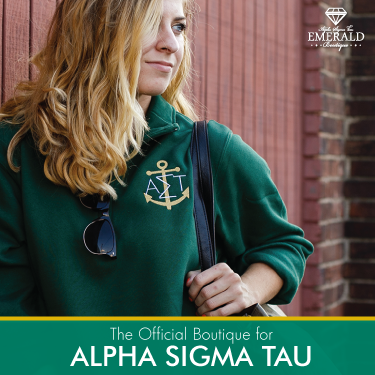 Your contribution is tax-deductible and supports the Alpha Sigma Tau Foundation, a 501 (c) (3) nonprofit that offers scholarships to members and provides financial support for many of the Sorority’s educational programs. As a member of the 1899 Society, you will receive one of four annual colored anchor Badge dangles (one per year) with the opportunity to collect all four colors over four years. Dangles will be distributed on-site at national events or mailed to your preferred address within one month from your contribution. The dangle for January 1 – December 31, 2019, is the yellow anchor pictured below. 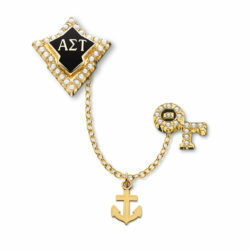 In addition to the dangle, members of the 1899 Society will also receive recognition on the Alpha Sigma Tau Sorority website, name tag ribbon recognition at national events, and the personal satisfaction of supporting an organization that is positively impacting the lives of you and your Sisters. Making your gift of $18.99 online now. Participating in Alpha Sigma Tau’s annual Founders Day of Giving.